Parents who wish to have their child baptized must be active, participating Catholics who will nurture their child’s faith. The parents must also attend a Baptismal Preparation Class, which takes place once a month (check your bulletin for upcoming dates). There are documents that need to be received at the parish office before a Baptismal date will be confirmed. Adults and children over the age of 7 who seek Baptism take part in the Rite of Christian Initiation for Adults (RCIA). Please contact Wendy Barber at the parish office for more information about Baptism. The standard time for reception of these sacraments for children is in the 2nd grade. Participation in 1st grade faith formation class on Sundays or in religious education at the school is a prerequisite. Preparation for First Reconciliation must take place before preparing for First Eucharist. Parents must attend meetings to assist their children in the home component of the program, which requires working through a home preparation book and assisting their children in other activities. Regular Reconciliation at the parish is held on Saturdays from 4:00 to 4:45 pm or by appointment. Please contact Lindsay Kohl at the parish office for more information about First Reconciliation and First Eucharist. The standard time for Confirmation is at the end of 8th grade or at the age of 14. Participation in the school's religious education class or the parish middle school youth ministry program is a necessary component of the preparation both before and during the 7th and 8th grade year. The Confirmation program begins each September and culminates with the Sacrament in the Easter season. Please contact parish office for more information about Confirmation. Everyone over the age of 7 who seeks to become Catholic, or who has not been baptized, participates in the Rite of Christian Initiation for Adults. The adult program involves regular sessions on Thursday evenings from 7:00 - 8:30 pm and several rites at the Masses on Sundays. In the summer months, meetings are reduced to once a month. We have an adapted program for adolescents based upon the average age and number of participants. Please contact Lindsay Kohl at the parish office for more information about RCIA. Congratulations! We look forward to working with both the bride and the groom at least 6 months before the wedding. The Pre Cana program at St. Pius X consists of a group gathering at St. PIus X, several meetings with a mentor couple, an online assessment and review with a trained facilitator or deacon, an Introduction to Natural Family Planning session, and meetings with the pastor and parish wedding coordinator. The term "Pre Cana" is derived from John 2:1-12, the Wedding Feast at Cana, where Jesus performs his first miracle of turning water into wine. 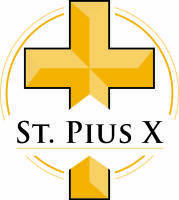 Please contact Lindsay Kohl at the parish office for more information on the Pre Cana program, or contact Liz Pendergrass to receive a copy of the St. Pius X Wedding Handbook.